511 Tactical Tactical Full Zip Sweater (72407) FREE SHIPPING! have many jackets and outerwear to choose from. 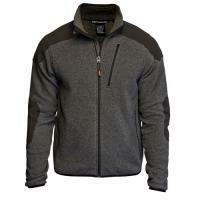 The 5.11 Tactical Full Zip Sweater (72407) combines fashion, comfort and utility. With the durability of a field jacket, the high-performance sweater seamlessly crosses the line between field duty and casual wear. Ready for vigorous activity, the brushed polyester sweater features welded shoulder and elbow patches for added resilience. Elasticized sleeve cuffs and waist bindings provide a secure, comfortable fit. An easy-to-access zippered chest pocket and a hidden lumbar zip pocket offer secure storage options, while the side pass-through panels provide access to an undershirt holster, making this sweater ideal for concealed off duty wear. ©2002-2019 CopsPlus.com: 511 Tactical Tactical Full Zip Sweater (72407) FREE SHIPPING!